*While supplies last. Limit 1 per transaction. Available from 4/24 in the following stores: NY 5th Ave, SoHo, and 34th Street. 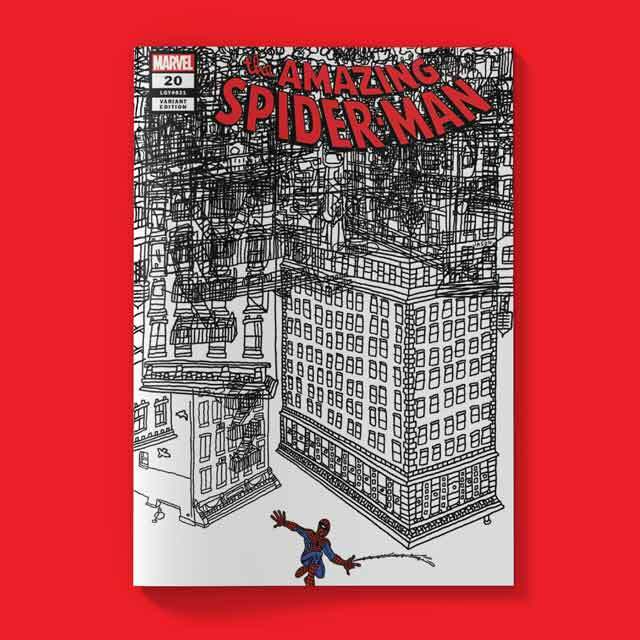 The Marvel-inspired artwork featured in our UT collection comes from New York-based artist Jason Polan, who has been drawing Marvel heroes since childhood. Here’s a little bit about him. I drew a lot. I liked hanging out with my family and my friends. I liked collecting things. One of the first things I collected were little fossils. I liked drawing dinosaurs. I played soccer and baseball. I liked swimming and watching movies. I had pet turtles. I liked going on trips with my family. What was your dream back then? I think I have always wanted to be an artist, probably because I never thought there was really any other option. I wasn’t quite sure what the logistics of it would be but drawing and doing art-related projects were what I enjoyed most. What was your first Marvel comic? This is a little embarrassing but I wasn’t much of a comic reader (or reader at all!) when I was little. I would spend hours looking at the drawings in them, though. I think Spider-Man was my first favorite Marvel Superhero. I liked how he looked, how he could fly through the air, his red-and-blue costume, the scenes in New York City, and so many other things. I am not sure I thought about it too much, but looking back on it now, I bet I also liked that Peter Parker wasn’t much older than me. Do you belong to a club? I belong to a few clubs! I started a club called Taco Bell Drawing Club right after I moved to New York. I thought it would be a fun way to meet other drawers around the city. Taco Bell Drawing Club has about 500 members now! I still have weekly meetings in New York but they have happened all over the world (including Tokyo’s Shibuya district!). What are your favorite art tools? I usually draw and write with a uniball vision elite bold black pen. I usually draw in a Strathmore 400 series Medium Surface 4”x6” Drawing pad. Where do you like to eat? I like eating at Taco Bell, Jimmy Johns, Hampton Chutney Company, and Five Guys. Name three of your favorite movies. Back to the Future 2, Field of Dreams, and The Red Balloon. What is your desk-side book? Right now, I am reading a Haruki Murakami book and a James Baldwin book. Who is your favorite rapper? I don’t usually carry a bag. I like having my hands open if I can, because I like being able to make a drawing quick if I see someone or something I really want to draw. My drawing pad and pen fit in my pocket. I usually wake up at 10 or 11 a.m. I wake up later than most people because I like staying up really late. I usually will look at the Internet for a little—send emails or post something on Instagram. I will then probably head to the post office to check my Post Office Box or mail packages or letters that I prepared the night before. I might stop and get a coffee. I will meander around SoHo, an area in downtown Manhattan that I like and live near. I might take a train up to the Museum of Modern Art to wander around a little. I really like drawing people there because they are focused on the art (and not me). I will probably get a sandwich up there or head back down to Union Square. I will probably stop at a bookstore or two and hopefully run into a friend or two. I might grab some groceries on the way home and then make dinner. I will scan the drawings I made throughout the day, or make new illustrations if I have a deadline coming up. I will write some mail and watch some things on the Internet, maybe a movie or a TV show. I will then read a bit and then go to bed.